For 4,000 years, the lavish crypt of the Pharaoh Mamose has never been found...until the Seventh Scroll, a cryptic message written by he slave Taita, gives beautiful Egyptologist Royan Al Simma a tantalizing clue to its location.But this is a treasure cache others would kill to possess. Only one step ahead of assassins, Royan runs for her life and into the arms of the only man she can trust, Sir Nicholas Quenton-Harper-a daring man who will stake his fortune and his life to join her hunt for the king's tomb. 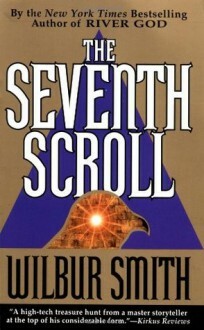 Together, they will embark on a breathtaking journey to the most exotic locale on earth, where the greatest mystery of ancient Egypt, a chilling danger and an explosive passion are waiting.Steeped in ancient mystery, drama and action, The Seventh Scroll is a masterpiece from a storyteller at the height of his powers. 4 1/2 Stars :)I enjoyed this book a lot. It is a mixture of Tomb Raider / Indiana Jones and River God. A really good read that i hope gets made into a movie!Action packed and a thrill ride through and through!